I’m Cycling Here: Drivers find it hard to spot bikes at night. IEEE Spectrum senior editor David Schneider built a flashing lighting rig to clearly mark his lane. I live less than a mile from the campus of the University of North Carolina, in Chapel Hill. Not surprisingly, many of the nearly 30,000 students enrolled there get around town on bicycles, day and night. I bike, too, but seldom do I go out after dark: I fear it’s just too dangerous. This feeling about the perils of nighttime cycling is shaped by my experiences as a driver. I often find myself approaching cyclists at night and hardly noticing them. Perhaps they have no rear light. Or maybe they’ve got a small red one blinking away, but it somehow doesn’t draw my attention the way the lights from other automobiles do. As I contemplated the issue, I realized that it’s not just a matter of putting out as many lumens as possible. A large part of the problem is that even a brightly blinking red light at the side of the road may not really register with drivers, who are looking ahead in their lane for the taillights of cars and trucks. Light It Up: Wooden “dummy” cells connect to each flashlight’s battery terminals [top]; power comes from an Arduino-controlled external source [center]. The flashlights [bottom] are arranged to project light onto the ground. I surveyed various kinds of bike lights, including those that take advantage of a phenomenon called persistence of vision (POV). These units affix lights to wheel spokes, which rotate rapidly enough to give the impression that the entire wheel is alight. They look cool, and can be made to create patterns that catch the eye when viewed from the side. The problem is that they don’t address the main issue—visibility from behind. While examining a video of a commercial POV bike light, however, I noticed that it did provide some visibility from the rear—by virtue of the light that was cast on the ground. I figured I could take advantage of that effect. Of course, the light had to be red. 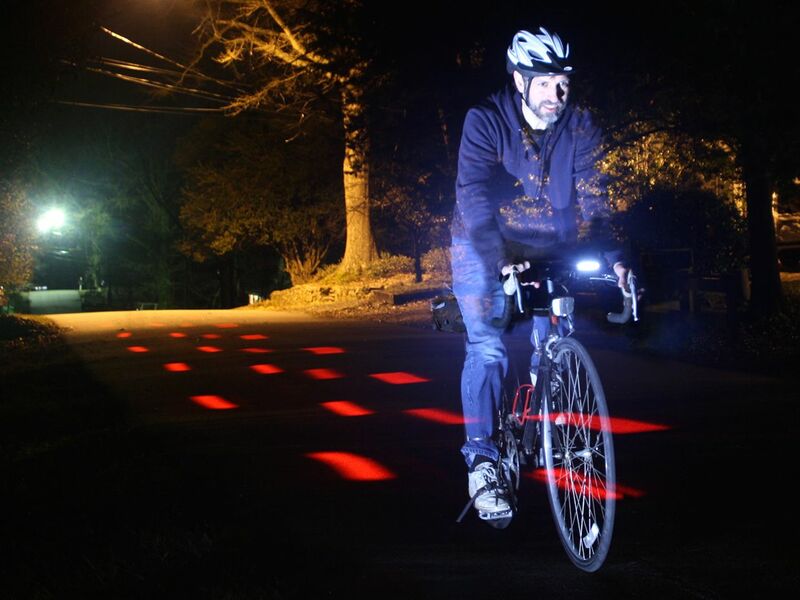 And I wanted to be able to project it well into the driving lane, not just illuminate the ground under the bike. A little browsing on Amazon.com turned up lots of candidates to use for that purpose. I settled on a small flashlight that contains a red LED and an adjustable focusing lens. Actually, I bought four of them. To control these lights, I use an Arduino Nano. The Nano is unable to channel enough current to power the flashlights directly, so I paired it with an inexpensive four-channel MOSFET-based switching module. The only other components of my novel bike light are a lithium-ion battery pack (the kind often used to run or recharge a phone) and a DC-to-DC converter, used to step down the voltage from the 5-volt battery pack to something more suitable for the flashlights. The flashlights are meant to run on either a 1.5-V AA battery or a 3.7-V lithium-ion 14500 cell. The manufacturer warns that the lifetime of the LED may be shortened at 3.7 V. So I set my DC-to-DC converter to output 2 V.
To alter the flashlights so they could run on an external power source, I made four wooden plugs that resemble AA batteries in their dimensions, one for each flashlight. Screws on either end of those plugs provide a point of contact between the flashlight’s battery terminals and power-carrying wires, which I route out of the flashlights through small holes. I mounted the four flashlights to a small frame that allows me to adjust the lights so that they project back behind the bike at various distances to the left. I programmed the Arduino to flash each light in turn so that a spot of red light appears first directly behind the bike and then increasingly far into the driving lane. This, I figured, would draw a driver’s attention without being overwhelming, just as a motor vehicle’s directional indicators or emergency flashers do. For good measure, I use a traditional red light under the bike seat as well. My trial runs were not without sweaty palms, given my general fear of riding at night. But I felt that much more confident knowing that I was indeed lit up like a Christmas tree. All this new bike light needs, I suppose, is a little tinsel.